A Medical Cannabis Treatment Option For John McCain’s Brain Cancer? U.S Senator John McCain has been diagnosed with a form of brain cancer that may be responsive to treatment with medical cannabis. The Senator’s office published a statement recently about Mr. McCain’s condition. 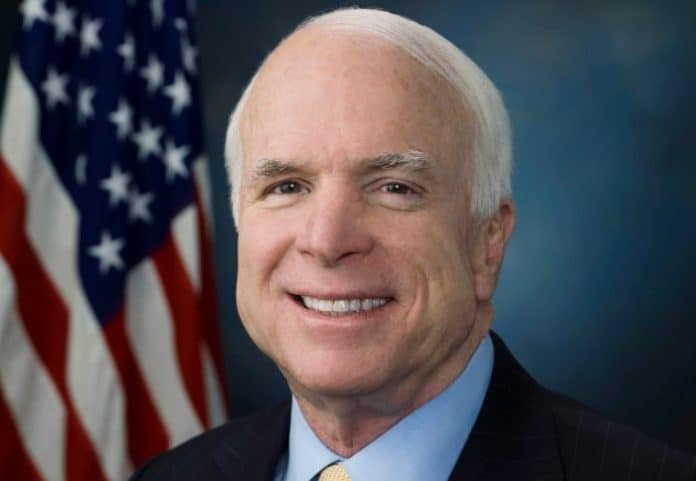 “On Friday, July 14, Sen. John McCain underwent a procedure to remove a blood clot from above his left eye at Mayo Clinic Hospital in Phoenix. Subsequent tissue pathology revealed that a primary brain tumor known as a glioblastoma was associated with the blood clot,” says the statement. According to the American Brain Tumor Association, glioblastomas are usually highly malignant and can be difficult to treat. The median survival in adults for aggressive cases is about 14.6 months and the two-year survival is 30%. “The Senator and his family are reviewing further treatment options with his Mayo Clinic care team. Treatment options may include a combination of chemotherapy and radiation,” said his office. A treatment not mentioned he may want to consider involves medical cannabis. A 2009 study indicated the cannabinoid THC induced autophagy (intracellular degradation) and cell death in different types of cancer cells but not in nontransformed astrocytes (star-shaped glial cells in the brain and spinal cord), which are resistant to cannabinoid killing action. Earlier this year, GW Pharmaceuticals reported positive results from a clinical study of a formulation of tetrahydrocannabinol (THC) and cannabidiol (CBD) used with 21 patients with recurrent glioblastoma multiforme, or GBM. It’s been 10 years since that statement and much has changed with regard to medical understanding of marijuana and its properties since that time. Whether Senator McCain has had a change of heart on the issue since then is hard to say, but luckily for him if he wants to pursue it is his home state is Arizona. Among the qualifying conditions in Arizona for the use of medical cannabis is cancer. Even if medical cannabis didn’t treat Senator McCain’s primary glioblastoma condition, it could help alleviate the effects of chemotherapy. In other recent related news, last month we reported researchers in the UK have determined cannabinoids are particularly effective in killing leukemia cells when used with conventional chemotherapy treatment.